Parking garages are subjected to abuse from traffic, water penetration, de-icing chemicals and oil. 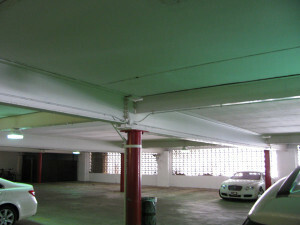 Parking garage repairs frequently involve repairs to both the parking deck surface and to overhead concrete structures. Adriatic’s team of experts will inspect the parking garage for any spalled, cracked, stained, or deteriorated concrete and repair or remove it if found. After we complete all required repairs to the parking garage, Adriatic Restoration specializes in parking garage restoration and repair. We are the region’s leaders in parking garage repair, parking garage maintenance, and parking garage construction. Adriatic’s team of parking garage contractors and solve the smallest problems in parking decks and garages such as sealant and expansion joint repair, commercial garage crack repair, spalling, or de-lamination. Our team will also address any corrosion of reinforcing steel (rebar), rust stains and leaks. Adriatic’s repair team will treat all of the concrete surfaces with a concrete deck coating. This will be accomplished by protecting the surface with the application of a waterproof membrane, such as an, epoxy deck coating, or a urethane deck coating.